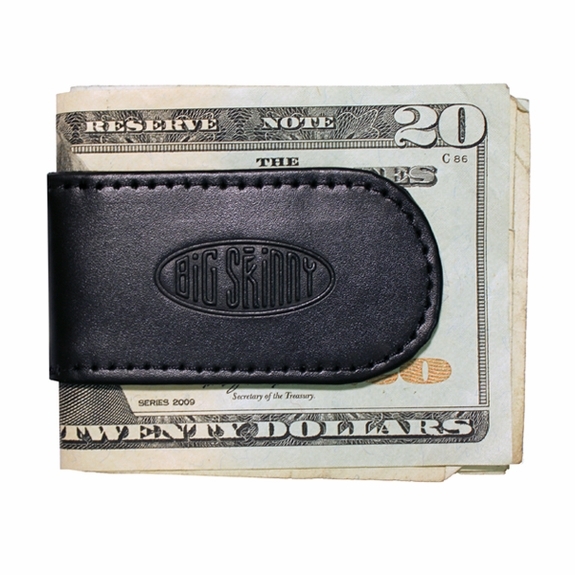 Stash your cash in a flash with a Leather Magnetic Cash Holder from Big Skinny. The clip is made with top-grain cowhide on the outside and nylon microfiber on the inside. The magnetic money clip can hold up to 20 bills (denomination is up to you) so your cash isn't free-floating in your pocket. The cash clip is thin and practical so it's comfortable to carry no matter how small your pockets are. If you've had trouble in the past with inferior metal money clips making holes in your pockets, you'll be pleased to learn that this money clip has a supple exterior and rounded corners to prevent accidental damage. Cash clips are a minimalist's dream accessory. They're light, simple and sleek, but more importantly, they cut out the messiness of bulky billfold pockets and loose sleeves. Keep your money all in one place and easy to grab with a sturdy money holder. Stop crumpling up bills and stuffing them in your pockets only to run them through the wash or tear them up. For anyone who carries bills with them every day, this cash holder is a must-have. To get the best use out of this product, simply fold your cash neatly in half and slip it into the mouth of the clip. This cash holder uses the reliable, but gentle power of magnets to keep your paper money safe and tidily stored. The money clip is carefully made using high-quality materials and strict attention to detail. The matching stitching and embossed logo give it a high-end look you're sure to love. The clip is made with rich tuxedo black leather and is an impressive gift for any occasion. The ultra-thin design is lightweight and is perfect for men of all ages. Now, it's easy to see why this cash holder is a hit with men, but ladies who hate the thought of loose bills floating in the recesses of a handbag or who are all too familiar with the woes of stuffing cash into their pockets, will love this money clip too. Our customers rave about this cash holder. They love the magnetic closure and how tough and sturdy it is. They also love that this magnetic doesn't ruin or damage the magnetic strips of their credit cards. I love this lightweight, fairly inexpensive money clip. EXCEPT...I couldn't find it (or my money!) this morning! I searched everywhere. When I got to work, I found that it had fallen out of my pocket and was stuck magnetically to a metal part of my desk chair. I guess that's good, but I didn't think the magnet was strong enough. But I do like it very much. I also own a big skinny wallet. The magnetic cash clip is just what I had hoped. The magnet is strong enough to hold 15 bills (or maybe more). Very attractive. Would definitely recommend it! This my first clip but I have bought a Big Skinny card case I keep in my front pocket. Love it! Great product. First money clip with enough magnetism to hold large bundle of cash. Looks nice and works great!! Wonderful and strong enough to hold a bunch of ones, fives or tens! This magnetic clip surpasses all others. It actually holds money!! Others I have tried can only hold a few bills before the magnets fail. You can easily put 10 - 20 bills in this money clip. And it will also attach itself to the few coins running around in your pocket. Perfect. I'll be back for another ... but the quality makes me think it might be years before this one wears out. Thank you Big Skinny! Nicely built and powerful magnet. I've not had problems with my credit cards. It does attract items to it, so you have to figure out if that will work for your wallet/pocket plan. I'm a bit disappointed and it might not be the fault of the product, but my expectations.